All of the above statements are true even if they seem contradictory. That’s what makes the beef and sustainability discussion so complicated—and so contentious. 1) How does beef production cause greenhouse gas emissions? 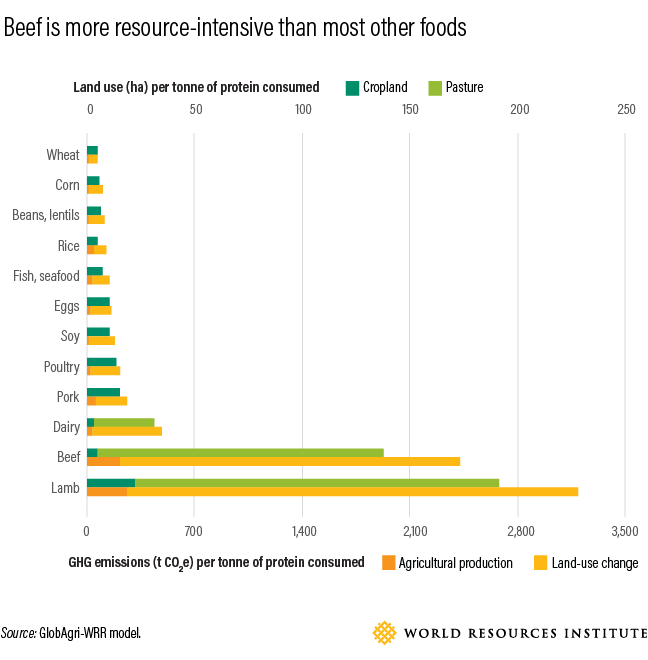 2) Is beef more resource-intensive than other foods? 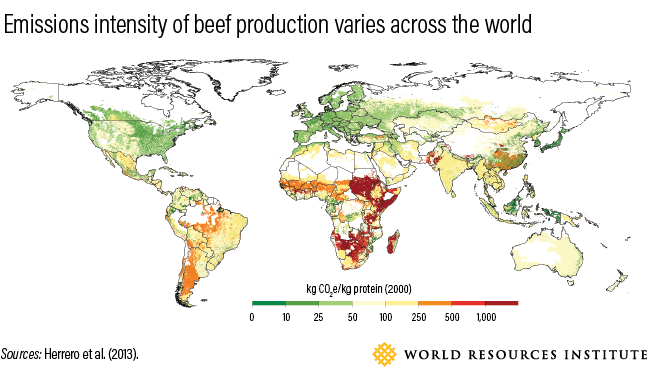 3) Why are some people saying beef production is only a small contributor to emissions? A 2017 study published in the Proceedings of the National Academy of Sciences estimated that removing all animals from U.S. agriculture would reduce U.S. emissions by only 3 percent. 4) Can beef be produced more sustainably? Examples of such improved practices abound. For example, some beef production in Colombia integrates trees and grasses onto pasturelands, helping the land produce a higher quantity and quality of feed. This can enable farmers to quadruple the number of cows per acre while greatly reducing methane emissions per pound of meat, as the cows grow more quickly. A study of dairy farms in Kenya found that supplementing typical cattle diets with high-quality feeds like napier grass and high-protein Calliandra shrubs—which can lead to faster cattle growth and greater milk production—could reduce methane emissions per liter of milk by 8–60 percent. 5) Do we all need to stop eating beef in order to curb climate change? The longer explanation: Reining in climate change won’t require everyone to become vegetarian or vegan, or even to stop eating beef. If ruminant meat consumption in high-consuming countries declined to about 50 calories a day, or 1.5 burgers per person per week—about half of current U.S. levels and 25 percent below current European levels, but still well above the national average for most countries—it would nearly eliminate the need for additional agricultural expansion (and associated deforestation), even in a world with 10 billion people. There are also other compelling reasons for people to shift toward plant-based foods. Some studies have shown that red meat consumption is associated with increased risk of heart disease, type 2 diabetes, stroke and colorectal cancer, and that diets higher in healthy plant-based foods (such as whole grains, fruits, vegetables, nuts and legumes) are associated with lower risks. In high-income regions like North America and Europe, people also consume more protein than they need to meet their dietary requirements. 6) Would eating less beef be bad for jobs in the food and agriculture sector? The longer explanation: Given projected future growth in meat demand across the developing world, even if people in higher-income countries eat less beef, the global market for beef will likely continue to grow in the coming decades. 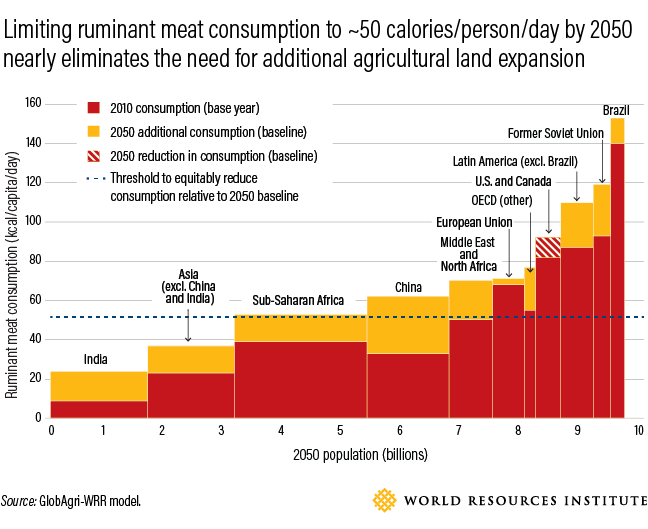 The scenario in the chart above leads to a 32 percent growth in global ruminant meat consumption between 2010 and 2050, versus 88 percent growth under business-as-usual. In the United States, despite declining per capita beef consumption, total beef production has held steady since the 1970s. Burgeoning demand in emerging markets like China will lead to more export opportunities in leading beef-producing countries, although building such markets takes time. In addition, major meat companies—including Tyson Foods, Cargill, Maple Leaf Foods and Perdue—are starting to invest in the fast-growing alternative protein market. They’re positioning themselves more broadly as “protein companies,” even as they work to reduce emissions from beef production in their supply chains through improved production practices. Beef is more resource-intensive than most other foods and has a substantial impact on the climate. A sustainable food future will require a range of strategies from farm to plate. Food producers and consumers alike have a role to play in reducing beef’s emissions as the global population continues to grow. And as we all work on strategies to curb climate change—whether in the agriculture sector, the energy sector, or beyond—it’s important we rely on the best available information to make decisions.